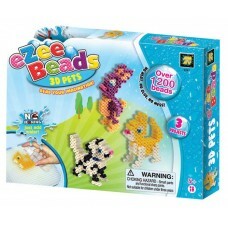 EZee Beads - Beading Sets WITHOUT ironing! You can make the plug-in cards with the original cards or create your own motifs. EZee Beads playfully supports fine motor skills and stimulates creativity, concentration and hand-eye coordination. The Animals Set offers 3 motif templates for the creation of different 3D animals. (Rabbit, cat and dog) The scope of delivery includes 1200 beading beads, an underlay, a color pattern, a water spray, a template for the individual parts of the animals.